← Yep, this brought me to tears! 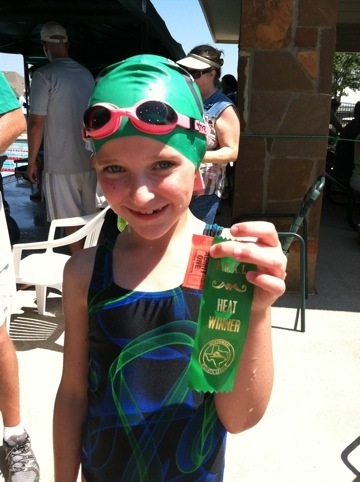 Today was Caleigh’s 3rd swim meet to participate in and I think she’s got it:) Last week she was to swim 3 strokes or events and I dont know whether it was her nerves or the heat but she just swam in 1. So let me put it like this….she is in 3 events totaling 6 minutes in the water tops for all 3 and she only did 1. Meanwhile we are working our volunteer shifts, and that so far is a “me-we”, and I’m thinking we cannot keep this pace up. But today made it worth it all. She did freestyle without counting the clouds between breaths, she did a beautiful backstroke, and didn’t get DQ-ed on her breast stroke or even come up swimming the wrong stroke for that event! What I think she got that only comes with experience is getting that ribbon for doing a “personal best” in time and that gets you a ticket for the prize tent! Anything for a prize! And someone must have convinced her to wear that swim cap to make her go faster. I know I worked the ready bench and couldn’t find her and she was waving to me she said over and over but when your expecting braided pony tail and get greenman group it’s shocking!